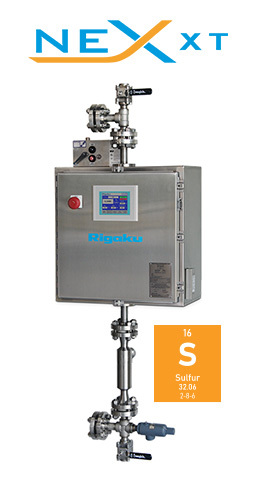 Rigaku's NEX XT is the next generation process gauge for high-level total sulfur measurement (0.02% to 6% S) of crude, bunker fuel, fuel oils, and other highly viscous hydrocarbons, including residuums. This versatile, compact and robust X-ray Transmission / Absorption (XRT / XRA) process gauge is specifically optimized for the total sulfur analysis needs of refineries, pipelines, blending operations, bunkering terminals and other storage facilities. Applications for the NEX XT include bunker fuel blending to meet MARPOL Annex VI sulfur restrictions, interface detection of different grade fuels delivered via pipelines, refinery feedstock blending and monitoring, and the quality monitoring of crude at remote collection and storage facilities. Applications include bunker fuel blending to meet MARPOL Annex VI sulfur restrictions, interface detection of different grade fuels delivered via pipelines, refinery feedstock blending and monitoring, and the quality monitoring of crude at remote collection and storage facilities. The new Rigaku NEX XT system is faster, more sensitive and far more compact than competitive systems and provides continuous, reliable detection of sulfur at pressures up to 1480 psig and 200ºC. 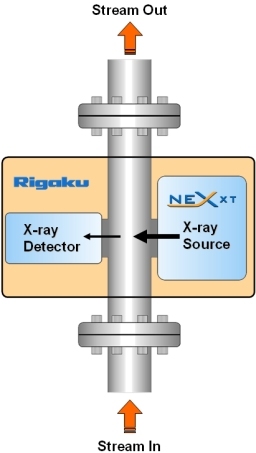 Rigaku NEX XT can operate as a stand-alone analyzer or provide real time closed loop control when tied into a blending or plant wide automation system. Among its other key features are a simplified user interface, reduced standards requirement, automatic density compensation, automatic water compensation, password protection, and standard platform for communicating sulfur, density, and water content to a plant-wide DCS. Due to its unique design and robust construction, sample conditioning and recovery systems are typically not required. X-ray Transmission (XRT) gauging has long been an accepted technique for the measurement of total sulfur (S) in heavy hydrocarbon process streams. Whether used for pipeline switching, crude oil blending or to assay or blend marine and bunker fuels, the Rigaku NEX XT XRT process analyzer is well suited to rigorous process environments, with pressures up to 1480 psig and temperature up to 200°C. X-ray transmission gauging involves measuring the attenuation of a monochromatic X-ray beam at a specific energy (21 keV) that is specific to sulfur (S). In practice, a process stream passes through a flowcell where sulfur (S), in the hydrocarbon matrix, absorbs X-rays transmitted between an X-ray source and detector. The recorded X-ray intensity is inversely proportional to the sulfur concentration, thus the highest sulfur levels transmit the least X-rays. 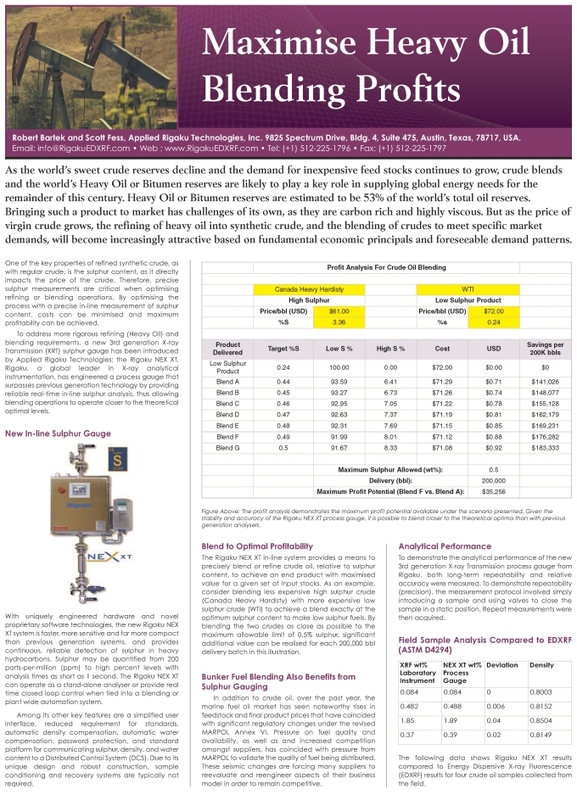 Maximize Heavy Oil Blending Profits. Robert Bartek and Scott Fess. Petro Ind. News: 11(6), 2010, p.44-45. 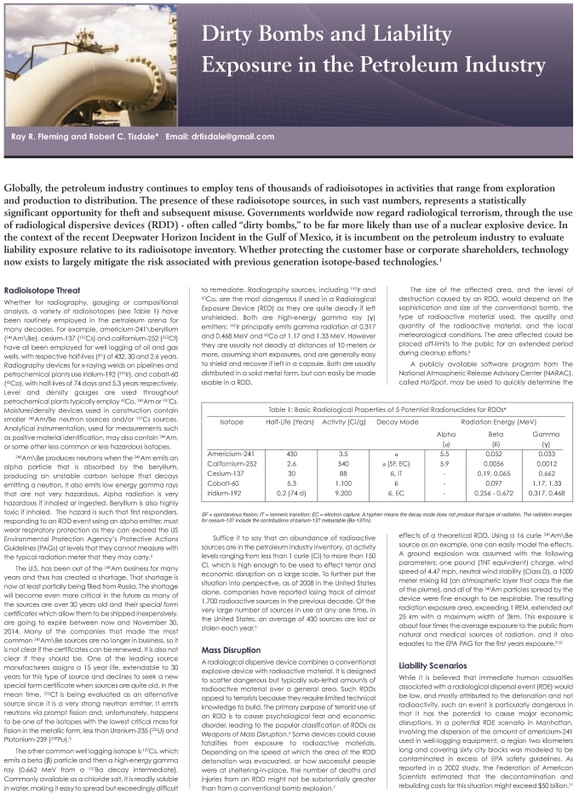 Dirty Bombs and Liability Exposure in the Petroleum Industry. Ray Fleming and Robert Tisdale. Petro Ind. News: 11(3), 2010, p.34-35.